Coloradans continue to debate single-payer healthcare ahead of a ballot initiative this November. The ballot initiative is known as Amendment 69 and creates something called ColoradoCare. Supporters of the effort are quoted as saying everything from "it is going to make a huge difference in people's lives" – to "this shows you the power and strength of when people come together." 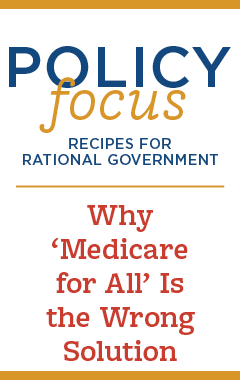 Some critics, meanwhile, say this creates a "Communist healthcare system," while others believe it ranks among the worst ideas ever in government. Hadley Heath Manning of Independent Women's Voice lives in Colorado. She's definitely not fond of the idea, citing free market and cost concerns. "This would result in a very high increase in our taxes and about a $25 billion a year increase in our state spending," says Manning. "Now, you have to take this with a grain of salt, because just about every government healthcare program has gone over budget in reality compared to the cost projections." Manning adds that employers are going to be faced with a payroll tax increase of 6.67 percent, and workers themselves will pay the other 3.33 percent, making it a 10-percent increase in payroll taxes. "This would give Colorado the highest payroll and income tax of any state in the country," she continues. "There is certainly a concern that there will be an in-migration of people who want to take advantage of the benefits of this kind of program; and also an out-migration of people in the state of Colorado, who do want to do business here, who have an entrepreneurial spirit, who have many workers on their payroll because this kind of tax increase simply won't be one that's easy to bear." Incidentally, ColoradoCare is permitted under ObamaCare. "The Affordable Care Act (ACA) or ObamaCare has a section which allows states to apply for a waiver from some of the law's requirements – and the way that a state can get one of these waivers is essentially by coming up with its own plan," explains Manning. "States have to ensure that they're going to cover just as many people as the ACA would cover and that people who are covered have the same level of benefit coverage as they would have had under the ACA." The website ColoradoCare.org says people would save big with ColoradoCare, while having better quality care under a plan that aims to cover everyone in Colorado. Supporters of ObamaCare have made similar claims over the years – claims that have been brought up every time there is a news report of higher premiums, taxes, and problems in Obamacare. "What's ironic is, one state has already tried something very similar to what Coloradans have the opportunity to do this fall," says Manning. "Vermont actually passed a single-payer healthcare program at the state level, but ultimately abandoned the proposal when they found that this was going to be bad for economic growth in their state, that the costs were actually going to heavily outweigh the benefits and it wasn't going to be feasible from a financial perspective. So I think that Coloradans should actually be paying attention to what's already taken place in Vermont."